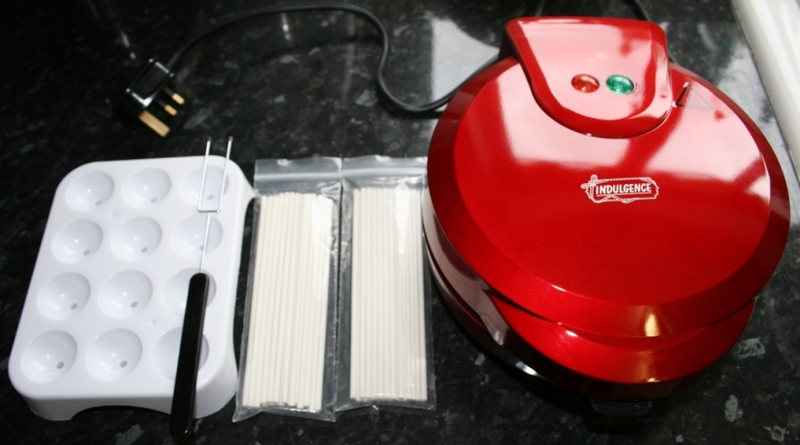 Cake Pop maker equipment has been around for a while now – maybe a few years looking around online – so we thought we’d get hold of the Indulgence cake pop maker and do a home baking review of our own! The pop maker we chose to buy was the model by “Indulgence” – it looks stylish and well presented and is exactly what we were looking out for in order to make the cakes. Now as you will see – I am no expert in baking but this is not a reflection on how the item works or how the cakes taste, nor does it affect my view on the item overall – basically it’s great! 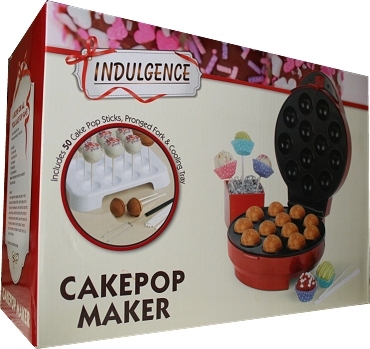 So now my baking skills are out of the way – lets take a closer look at the “Indulgence Cake Pop Maker”. 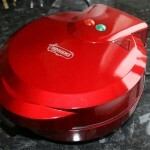 The pop maker is a deep red metalic colour and has room inside for 12 pop’s to be baked in one session. The package comes with a tray for cooling off the cakes and standing time once the cooking is complete – also included are two packs of sticks to insert into the buns to make them into the pops which adds to the fun. There is also a pronged fork which allows easy removal of the cakes from the non-stick surface. When we switched the cooker on for the first time (and this is noted in the instructions) a fair amount of smoke came off the gadget – which isn’t in the slightest bit of a concern, but we had to leave it on for about 10 minutes before it stopped. We didn’t want to baking spoiled by the taste or smell of smoke so the instructions were followed to burn off the excess material (or whatever it actually is) – maybe from production. We got the kids busy with the mixing bowl and added all the ingredients for making a basic vanilla mix from an existing recipe – just a simple mixture for our first use. The maker was opened and allowed to cool slightly for a few minutes and when the mixture was ready we closed off the lid again and waited for the ready light to indicate that the operating temperature had been reached and the device was ready to cook the cakes. Now this is where things do admittedly get a little bit on the tricky side. You have to heat the moulding plates and then insert the mixture, and I immediately knew that there was now a requirement for a little speed and dexterity with the mixture. Why? Because I reasoned that due to heat already being reached, the mixture would start to bake almost right away on contact with the moulds and would therefore begin to rise quite quickly. At this point in the process I also panicked a bit aswell (in a fun sort of way!) because I had only read the part of the instructions which mentioned a measurement of one tablespoon full of mix per mould – rather than the more accurate part which stated that their should be enough to fill each section up to 2mm from the top! Needless to say – I am afraid I put too much in. Not a major problem though – but the dough did start to expand and rise before I had time to fill all of the slots. So there are two points to note here – fill each one slightly less than I did, and also fill the quicker!!!! As you can observe in the above image, the pods were overflowing, primarily this is because I was too slow – you can see that the ones on the left and bottom have started to heat up and spread – whereas there are a few still cool enough not to have started baking. I would say the one at about 1 oclock at the top is pretty much perfect, and that would be the goal really – to have each one filled to that capacity as quickly and efficiently as possible with as little spillage or mess as possible, unlike the rest of them. Not to worry – I closed the lid and set a timer on the oven to 5 minutes which is the recommended cooking time for the cake pops. Some of the mix squeezed out of the sides and ran down onto the kitchen worktop, no big deal – it just wiped up as the baking continued. After the 5 minutes were up, I opened up the lid and saw the following. Take a look at the one at the top where there has only been a bit of spillage, this is what they all should look like!!! When I bake again I will take another picture and add it. But you can easily see where I went wrong, and it’s my fault totally – the actual machine worked like a dream (and it should also be credited for the way it handled my mess – I.E. no problem – it just cooked the excess ingredients and they slipped right out and broke away from the cakes with no trouble at all). The cakes tasted 100% perfect and the kids loved them – I will definitely be using this again and would recommend it as a fun way to bake. 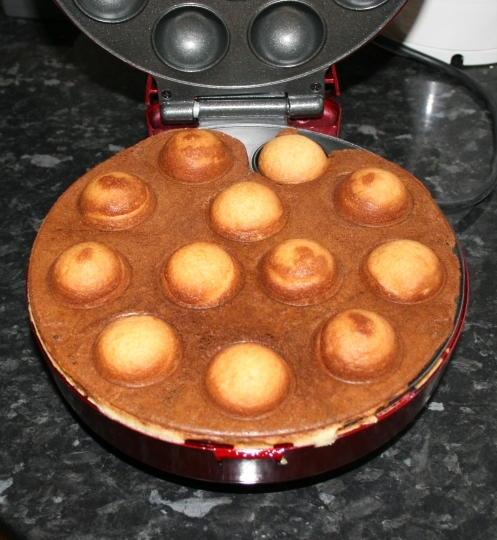 Here is one more picture of the Indulgence Cake Pop Maker in situ along with its cooling tray fork and sticks. 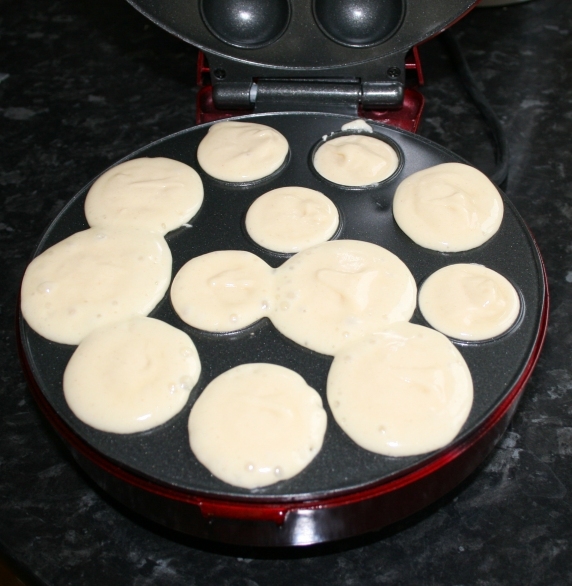 - Easy to Open with Good Non-Stick Coating. - You have to be fast - but thats my problem!